The British territory of Anguilla is one of the Caribbean’s best kept secrets. Small in size and contemporary in style, it is lined with 33 pristine white sandy beaches and surrounded by clear turquoise waters. This beautiful island is a mere 35 square miles and yet has over 120 restaurants, reflecting the island’s passion for food and eating (crayfish and lobster are the national dish!). For the energetic there is a wealth of sporting activities on both land and sea (sailing and boat racing is the national sport), while heritage, culture and music feature in the island’s many lively festivals and events. Location Today over 14,000 Anguillians and a small expatriate community inhabit the island. Situated about 100 miles north west of Antigua and 150 miles east of Puerto Rico, Anguilla is the most northerly of the Leeward Islands. Measuring just 16 miles by 3 miles and with a flat landscape, the island is long and narrow with the capital, The Valley, at its centre. Weather Anguilla is warm all year round with some periods being more humid than others. Average temperatures are 27°C with trade winds providing a constant warm breeze. Average rainfall is 35 inches per year, much of it arriving in short cloud bursts. Environment Anguilla is low lying with no mountains and its limestone and coral terrain provides the most stunning powder soft beaches. Six designated marine parks exist and there is a long standing programme to protect sea turtles. Sala ponds across the island provide an excellent vantage point to observe the island’s birdlife. Dining Food is a central feature of the Anguillian experience. Inspired by the ocean and with an international flair, the island offers over 120 dining options and proudly boasts some of the Caribbean’s most talented chefs and self-taught cooks. From fine dining to the most tasty and simple roadside barbecues and local bistros, Anguilla is a true gourmet paradise. And dining out isn’t just for visitors – it’s an island way of life so it has real authenticity and you’ll be eating alongside locals. Music Although Anguilla is regarded as one of the quieter Caribbean islands, music plays a big part its culture and on any night of the week or weekend you can find somewhere to experience local talent. The town of Sandy Ground is famous for its music nights and the beat from the beachside bars and local musicians gets the crowd to their feet and dancing the night away with calypso, reggae and jazz. Activities Laid-back by day and pulsating at night, Anguilla is a diverse mix of experiences on and and sea that go beyond size. 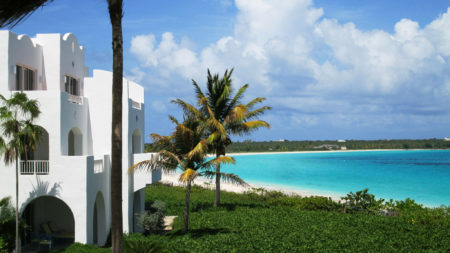 For those in the know, Anguilla is renowned for its unspoilt, tranquil white sand beaches. Alternatively you may choose to visit a gallery, tour a historic site or museum, take a horseback ride, explore the island, try sailing, go snorkelling, have a massage at one of the island’s superb spas or just relax and unwind. Anguilla’s international gateway is Clayton J Lloyd airport and currently there are no direct scheduled international flights so you will need to touch down in either Antigua, St Maarten or St Thomas and change onto a connecting flight. There are also ferry transfers available if you prefer to take the slower route.